LAKEWOOD, Colo. -- Among the many framed comic strips in the Mountain States Legal Foundation president's office here is one of a Zeus-like character perched on a cloud and holding a thunderbolt. "Let's keep them off balance," the caption says. "Try to hit an environmentalist." That pretty much sums up the philosophy of the foundation launched in the late 1970s as a conservative counterweight to environmental groups' litigation efforts. Mountain States has defended the government against the likes of the Sierra Club and Defenders of Wildlife. But lately the foundation has been taking on the government, challenging what it views as regulatory overreach. This month, the nonprofit foundation based in a Denver suburb will be at the Supreme Court representing a Wyoming property owner who says the Forest Service had no right to build a bicycle trail on an abandoned railway that bisects his property (Greenwire, Dec. 3). 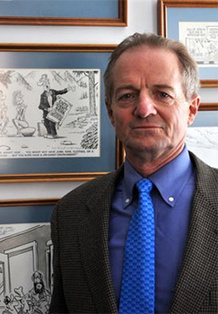 William Perry Pendley, the foundation's president, said the case shows the government flouting property rights and acting without accountability. That, he said, is a troubling trend that has given Mountain States plenty of litigation opportunities. "A Marine under attack says it's a target-rich environment. We can shoot in any direction and hit the enemy," said Pendley, a rangy former Marine who served in the Interior Department under President Reagan. "That's what we have -- a target-rich environment. And that's not a good thing." William Perry Pendley, a former Interior Department official and president of the Mountain States Legal Foundation, says there is "no adult supervision" in Washington, D.C. All photos by Jeremy P. Jacobs. Regardless of which party controls the White House and Congress, he said, "there's no adult supervision." But while Pendley calls his group a watchdog without a policy agenda, Mountain States' critics say it's driven by the ideology of the oil, gas and coal industries -- an accusation unlikely to upset Pendley, who displays "Friend of Coal" and "Keep Calm, Frac On" stickers on his Mercedes SUV's rear window. "To my knowledge, they have never taken a case where you would expect the outcome to be increased environmental protection," said Jay Tutchton of Defenders of Wildlife, who has frequently done legal battle with Mountain States. "Their cases seek to roll back environmental protections." Mountain States was founded in 1977 by beer magnate Joe Coors, and its first president was James Watt, who later became Reagan's Interior secretary. President George W. Bush's Interior secretary, Gale Norton, also worked at Mountain States in its early years. Norton said training as a young lawyer at Mountain States was "like learning to swim by jumping into the deep end of the pool." While staff attorneys are advised by outside advisers -- one of Norton's was former Arizona Sen. Jon Kyl (R) before he ran for office -- the foundation's attorneys were often tasked with trying high profile cases. Two of Norton's earned front page coverage in the Denver Post. "Mostly we learned by doing," Norton said in an email. "Young lawyers at a law firm would never get that kind of responsibility." When the foundation needed a new president in 1989, it turned to Pendley, who has ties to the Rocky Mountain West and Washington, D.C.
Pendley, 68, was born and raised in Cheyenne, Wyo., then went to George Washington University for his undergraduate degree. He returned to his home state for a law degree at the University of Wyoming College of Law in Laramie. While in law school, Pendley joined the Marines during the Vietnam War. He was based in Japan and the Philippines, flying electronic countermeasures to assist bombing runs over north Vietnam. He finished his degree after the war, returning to Washington because of the weak job market in Wyoming. He worked for former Wyoming Sen. Cliff Hansen (R) and what was then the House Interior and Insular Affairs Committee. When Ronald Reagan became president, Pendley helped shepherd Watt through his Senate confirmation to be Interior secretary. He then took a job at the department, where he was deputy assistant secretary for energy and minerals. Pendley, who wears black cowboy boots and a large Western belt buckle with his business suits, isn't shy about offering his views. He has a syndicated monthly column called "Summary Judgement" and has written four books, most recently last year's "Sagebrush Rebel: Reagan's Battle with Environmental Extremists and Why It Matters today." When he took the helm of the foundation, he quickly shifted its focus. Until that point, it was heavily involved in commenting on Interior's resource management plans for various federal lands. The new president believed the foundation needed high-profile litigation. "Real clients, real cases, real controversy," Pendley said of his philosophy then. "Leave litigation to us. Let us litigate." Pendly set three goals. The first: Win the lawsuit. With only a $2 million annual budget and seven attorneys, Pendley cast the foundation as an underdog in many of its lawsuits. The case before the Supreme Court, which will be argued by Mountain States' chief legal officer, Steven Lechner, spotlights Wyoming landowner Marvin Brandt's fight against the Forest Service. "For golly sake. ... It's Marvin Brandt versus the United States government," Pendley said. "That's a huge deal." Mountain States' second goal: Set a legal precedent that will help others in similar situation. And third: Take cases that will educate people on what the foundation considers "threats to constitutional liberty and the rule of law." To illustrate his foundation's philosophy, Pendley told the tale of a Montana rancher's encounter with grizzly bears. One night in September 1989, he said, several grizzlies descended on John Shuler's sheep pen near Dupuyer, and the rancher ran out of his house to protect his animals. One bear looked like it was about to attack him, and Shuler shot and killed it. The Fish and Wildlife Service fined Shuler $5,000 for killing the grizzly, which is protected under the Endangered Species Act. Mountain States challenged the fine in federal court, and a judge reversed the service's decision, saying the government's argument that Shuler provoked the bear was "unpersuasive." Since then, the foundation has grown, but it remains significantly smaller than other legal foundations and the litigation arms of several environmental groups. In 2012, Mountain States raised $2.8 million and spent $2.1 million, according to tax forms for that year. That supported seven attorneys and a handful of staff. By comparison, the Pacific Legal Foundation -- a conservative Sacramento-based nonprofit that has been active in environmental and property rights litigation -- raised $8.7 million and spent nearly $8 million in 2012 on a staff of nearly 20 attorneys, according to tax filings. 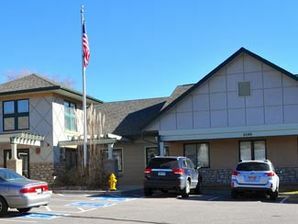 The Mountain States Legal Foundation, located in suburban Denver, has sought to be a conservative counterweight to environmentalists’ litigation efforts. Mountain States says a third of its funding in 2012 came from 81 large donors whose contributions ranged from $600,000 to $5,000. Another third came from about 200 donors who gave between $1,000 and $5,000. The last third came from about 17,500 individuals who contributed up to $1,000. The average contribution was $431 in 2012, the foundation says, though it acknowledges that it received funds from "major corporations" and seven grants from national foundations ranging from $15,000 to $75,000. Pendley said he is looking to expand. At any time, the foundation is involved in around 40 cases selected by its volunteer board of litigation. And each of those cases is carefully picked, he said. "Our statement of purpose," Pendley said, "is individual liberty, the right to own and use property, limited and ethical government, and the free enterprise system." Mountain States' critics, however, say that "statement of purpose" sounds remarkably similar to industry ideology. Defenders of Wildlife's Tutchton said property rights have historically been used as a proactive way to roll back environmental regulations. One former Mountain States attorney who now works for an environmental group in the West said it can be hard to separate the foundation's loyalty to its client from its fealty to its beliefs. "Those two things don't always mesh," said the attorney, who asked not to be identified to avoid being associated with the foundation. "As an ethical issue, I found it contrary to my oath as a lawyer -- to have two clients who have competing interests." Timothy Preso of the environmental law firm Earthjustice added that Mountain States is "very aggressive" at pushing its viewpoint in court. "To think about it geometrically -- if you put us on one side of a circle and went 180 degrees to the other side, you'd find them," Preso said. "They are the opposite of what we try to achieve. Their work clearly reflects an agenda, and that reflects advancing the cause of pro-development interests." It's hard to pin down how effective Mountain States has been. Much of its caseload consists of litigation in which it files amicus, or friend of the court, briefs in support of the government when it is challenged by environmental groups. That requires much less work than litigating a case, and in most instances the group is advocating only for the status quo. Lechner, the foundation's chief legal officer, said that is gradually changing and the foundation is filing more of its own cases. Moreover, several lawyers said Mountain States is less influential than the Pacific Legal Foundation, which won two cases at the Supreme Court last year -- including defeating U.S. EPA in a major Clean Water Act enforcement dispute (Greenwire, Aug. 17, 2012). "I think they think they are playing a big role, but I think they work around the margins because they have a small budget," the former Mountain States staff attorney said. Mountain States has been litigated at the Supreme Court before. In 1995, Pendley argued -- and won -- a case involving a federal policy that provided financial incentives to a government contractor if the company's subcontractors were owned by "socially and economically disadvantaged individuals," which typically meant minorities. Pendley successfully argued that the policy discriminated against his client, Randy Pech of Adarand Constructors Inc., a white man, when his Colorado Springs-based company was passed over for a subcontract. And on other conservation issues, the group has been effective politically. Mountain States was part of the groundswell that raised the profile of the gray wolf and its protections under the Endangered Species Act that prohibited ranchers from using lethal force. The foundation lost its case, but Congress bit on the issue, passing legislation to delist the gray wolf in Montana and Idaho. The Fish and Wildlife Service has since delisted the wolves in Wyoming and proposed delisting them in all of the lower 48 states, except for New Mexico and Arizona. All the delistings have been sharply criticized by conservationists, who are challenging the Wyoming action in federal court. "They might not win in the courtroom," Tutchton said, "but they are winning on the issue." The Supreme Court case this year will undoubtedly raise the foundation's profile, and with that usually comes more funding and the opportunity to pursue high-profile cases. Pendley already has a few in mind, including a challenge to regulations on the use of hydraulic fracturing to drill for natural gas -- if those rules are finalized. The Bureau of Land Management in May proposed a rule that would require disclosure of fluids injected underground during fracking, as well as set tougher standards for demonstrating well bore integrity and managing flowback water. The proposal elicited nearly a million comments last summer, and BLM has given little indication of when it will finalize the regulations. Pendley, however, said if BLM goes forward with them, he'll be ready with a lawsuit. Much as the gas industry has repeatedly claimed, Pendley said BLM has yet to show an instance of groundwater contamination that is the direct result of hydraulic fracturing. The rule does, however, also cover other aspects of natural gas drilling that have caused water contamination. Without a concrete example linked to fracking, Pendley said, BLM lacks the environmental impact it needs to go forward with the regulations. "It's the epitome of arbitrary and capricious," he said.